EDITOR’S NOTE: Andrew Salvador is a High Tech High Media Arts student currently participating in a month-long internship at Birch Aquarium at Scripps. The program is designed to foster personal growth and help students acquire workplace skills in a real-world environment. In addition to assisting with education programs, Andrew is blogging about the many classes, exhibits, and other daily happenings here at Birch Aquarium. Andrew fell in love with marine life after a snorkeling experience off the coast of Mexico. He has always loved the ocean and considers the internship a perfect fit. 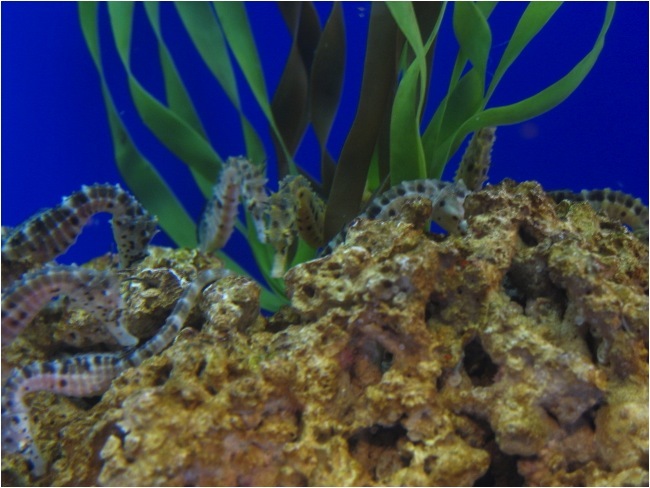 A group of Juvenile Pot-bellied Seahorses, born September 2012 at Birch Aquarium at Scripps. The striking features of juvenile pot-bellied seahorses leave you in awe. You’ll see these rocky-colored seahorses (Latin name: Hippocampus abdominalis) huddled together and curved around coral reefs. At Birch Aquarium at Scripps, our last group of juveniles were born on Sept. 12, 2012. As you can tell by their name, pot-bellied seahorses have large stomachs and small dorsal fins to maneuver among marine plants and algae. Pot-bellied seahorses can grow more than a foot long, which makes these fish one of the largest seahorse species. Many don’t realize that male seahorses are actually the ones that become pregnant. Males carry the baby seahorses between three and six weeks. When the males finally give birth, hundreds of young seahorses swim out from their bellies. The moment those babies are born, they are on their own. Not many survive because seahorses are not the fastest-swimming animals; camouflage is their best line of defense. In fact, some seahorses can grow bumps to resemble components of their surroundings. Other seahorse relatives, such as weedy sea dragons, are closely mimic kelp and other seaweeds. Birch Aquarium houses more than a dozen seahorse species and their relatives, including weedy and leafy seadragons, Pacific seahorses, and various others. In recent years, humans have been overfishing these animals, resulting in the depletion of seahorse populations all across the world. Birch Aquarium began an extensive breeding program for these creatures back in 1994. Through this program, we take care of the seahorses from the time they are born at the aquarium until they get big enough to ship to various aquariums worldwide, reducing the need to collect from the wild. When the animals are first born, they are transferred to special tanks called kreisels. In these tanks, we serve the seahorses about 3,000 newly hatched brine shrimp a day to accommodate for their small mouths. Seahorses are personally one of my favorite marine animals. They are really fascinating, and you should definitely come see There’s Something About Seahorses, our wonderful exhibit featuring more than a dozen species.